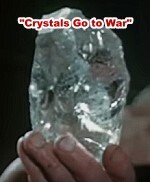 Many thanks to Kevin, of Roanoke, VA, for sending me a link to this documentary video covering the entire production chain for radio crystals as filmed by Reeves Sound Laboratory, in New York, NY. It was produced during World War II so the methods used are not anywhere near what is common today. What is the same, fundamentally, is the ingenuity and hard work that goes into developing a new technology, and particularly the effort needed to move to high volume production. As with most of these vintage factory films, a few aspects of normal practices of the era are immediately apparent. First is the near utter lack of personal safety devices on machinery and accessories for workers. Fingers run perilously close to diamond-impregnated crystal dicing blades, unprotected hands and arms are submersed in oils and cleaning solutions, no ear protectors for high ambient sound levels, rarely seen eye protection, loose clothing being worn near rotating machinery, etc. It is no wonder there were so many industrial accidents. A high level of manual labor is employed in contrast to ubiquitous automation in modern factories. While watching the film you might wonder how anyone or group of people figure out all the details. Having worked in high volume environments myself (as an engineer, not as a line worker), I have witnessed the tedium of sitting at a work station, doing the same job all day, day after day, and yet most people in those jobs did not seem to mind. They were able to carry on conversations with co-workers, take their scheduled breaks, go on vacations, and have their evenings and weekends free to live life as they pleased without the worries that ruled the lives of the engineers, scientists, technicians, accountants, and managers who were responsible for the details of design, implementation, troubleshooting, material sourcing, customer interfaces, financial obligations, schedules, etc. Everybody has a place and collectively all are essential to success. If you like viewing these kinds of documentaries, the Internet is replete with similar examples for almost any subject. Having produced and posted videos on YouTube, I know first-hand that there can be a fair amount of work involved in making such information available, so I have great gratitude for those who do it for my edification.